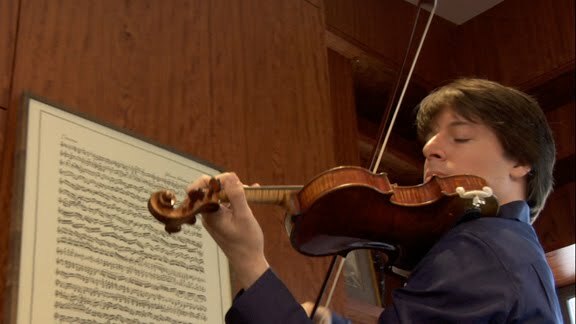 Joshua Bell is coming back to Washington this month, for a recital in the Kennedy Center Concert Hall sponsored by Washington Performing Arts Society (January 23, 8 pm). Bell is a regular visitor to the area, as both a recitalist and a concerto soloist, and his last WPAS recital was only two seasons ago. His performing partner in 2009, Jeremy Denk, is not on the program this year (although Denk has his own WPAS recital later in the season), but another Bell regular, Sam Haywood, will be at the keyboard. Last month, before heading off to the longest break he gets in a very busy schedule of concertizing, the American violinist took some time to answer a few questions about his recital, as well as about his plans for the future. His answers may surprise you. Bell's repertory tends to veer toward the Romantic, the sort of broad, melody-centered music best suited to his style. He is playing the first Bruch concerto again this season, a piece he described as a "standard blockbuster," the kind of "beautiful Romantic piece people are always asking for." I describe his WPAS program as similarly Romantic-heavy: does he ever tire of playing pieces like this? "It is important to keep repertoire varied," he says. "I do take time off from pieces that I feel I have played too much." He adds that the Brahms concerto is "probably my favorite right now," although he has been working on a Shostakovich concerto to add to his repertoire. "I usually give myself a month or so free from performing to work up a new concerto, after I have spent a year or so dabbling with it, playing it here and there without focusing intensely on it." As Bell sees it, the Mendelssohn and Brahms pieces on his Kennedy Center program (the latter was also on the 2009 recital) are "more classical," and the Ravel and Ysaÿe sonatas, as well as the arrangement of Gershwin's preludes, are all "from the 20th century." From the age of 12, Bell's violin teacher at Indiana University, where he grew up because his father taught there, was Josef Gingold, which might have had something to do with Bell's predilection for the 19th century. "He came from a Romantic background," Bell agrees, "so that is part of my musical formation." He still goes back to Indiana once a semester generally, for a week to give classes. The school of music there a has an excellent program in historically informed performance practice: what are his thoughts about playing Baroque music with that kind of approach? "I do play Bach and Vivaldi, with my own take," he says first, adding that he has performed with Roger Norrington and John Eliot Gardiner, and with Steven Isserlis. "But I have thought about going farther back in the Baroque period, possibly studying with a specialist, maybe even in the coming year, just for curiosity's sake." The one-time boy wonder of American violinists, Bell just turned 44, but he keeps up a hectic pace, recently adding the job of directing the Academy of St. Martin in the Fields chamber orchestra. Is he a workaholic? "Definitely not," Bell laughs. "I love to take my days off, but I do tend to bite off enough challenging work to keep myself busy. I have a hard time saying no." 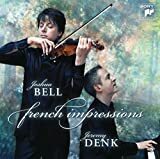 This past weekend, he launched a new CD, with Denk, in New York, called French Impressions, officially released yesterday. The disc, which has been recent listening, does not do much to change that image of Bell as an unrepentant Romantic in his programming choices. Not that there is anything wrong with that, especially since he plays this music so well. Quite admirably, Bell is a traditionalist in many ways. "I don't listen to a lot of popular music, I have to say," he admitted. "I hear it from friends and from going out with them; but I don't listen to a lot of it, although I do like old rock and other music." Attempts to popularize classical music for young audiences "can go too far in bowdlerizing the music," he added. "A Beethoven symphony can stand on its own without getting cheapened with film music or video game ploys." The French disc does not offer any must-have performances: these three sonatas by Saint-Saëns, Franck, and Ravel have been recorded by a wide field (indeed, Bell himself has already recorded the Franck sonata before). Still, it is a passionately played, well-considered disc, featuring particularly thoughtful program notes by Jeremy Denk (nothing there about the "hairballs of ecstasy" inspired by the Franck sonata, as he wrote on his blog). When pressed for thoughts about his plans for the future, Bell confided an unexpected interest in composing music at some point. So far he has not composed much, other than having created his own cadenzas for concertos like the Mendelssohn, Beethoven, and Brahms. He also pointed to his improvisations for his projects on Bernstein and Gershwin, as well as his transcriptions and arrangements for the album Romance of the Violin. As for what composers he would list as influences, Ball says that his models would likely be one of the violinist-composers, like Kreisler, Sarasate, or Ysaÿe -- the latter taught Bell's teacher, Gingold. What does he most like to do with his spare time when he comes to Washington? He has a lot of friends here, including some who play in the National Symphony Orchestra. "I do seem to have come to Washington a lot in the last few years," he admits. "It is always good to go out to dinner with friends." One thing is certain, he says emphatically, with a laugh. "I will NOT be playing in a Metro station again." Joshua Bell and Sam Haywood will perform later this month, on a concert sponsored by the Washington Performing Arts Society (January 23, 8 pm), in the Kennedy Center Concert Hall. The program includes Mendelssohn's Sonata in F major, Brahms's Sonata No. 3 in D minor, op. 108, Ravel's Sonata for Violin and Piano, Ysaÿe's Violin Sonata in D minor, op. 27, no. 3 ("Ballade"), and an arrangement of Gershwin's Three Preludes.